The Catholic church at Bandel, near Hooghly, in the middle distance, buildings on the river bank and boats in the foreground. 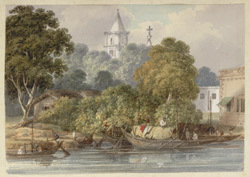 bl.uk > Online Gallery Home	> Online exhibitions	> Asia, Pacific and Africa Collections	> The Catholic church at Bandel, near Hooghly, in the middle distance, buildings on the river bank and boats in the foreground. album in red leather covers with a gold stamped border, containing 28 water-colours of a trip along the Bhagirathi and Ganges Rivers, dated August to October 1820. The trip must have been to take up his new appointment as Opium Agent at Patna. The boat in the foreground is a budgerow (bazra), passenger-carrying native cargo barges, half covered with a roof construction which has been described as resembling 'a haystack upon a barge'.